Bedroom Rugs – At times, a bare floor may look like it does more harm than good. It can make your home look boring. Plus, a lack of a rug can help dirt and dust track through the house. Unless your wooden floors are the focal point in a specific area of your home, adding rugs and carpets can do wonders for your home. Rugs and carpets can make your home look cozier and add a wonderful feel of fabric underneath your feet. They can save your floors in areas of heavy foot traffic. Adding bedroom area rugs to your bedroom creates a delineation between your bed and sitting area. Choosing a rug to install in your bedroom, however, may be a bit of a challenge especially when you have different types of rugs to consider. The first thing that you need to figure out is where you will be placing your bedroom rugs. Will it be under your bed, beside your bed or at the foot of your bed? Once you determine where you will place this rug, here are some other tips when it comes to getting an area rug for your bedroom. Regardless of what room you’ll be installing your rugs, a general rule is that it should not touch the walls. There should be at least 5 inches between the wall and the edge of the rug. If the room is very large, leave a minimum of 8 inches. You can still choose a larger rug if you have a small bedroom. A large area rug will do just fine as long as it doesn’t touch the walls. For those that love the look of their bare floor but hate the feel of a cold floor under their feet, buy a pair of rugs for either side of the bed. Consider runners that will provide a symmetrical look to the room. This is a classic area rug that will make your space extra cozy, but if you don’t want your room to be looking way too retro, look for shag rugs that come with patterns. Skip the olive and mustard shades as they are not really ideal for the bedroom. 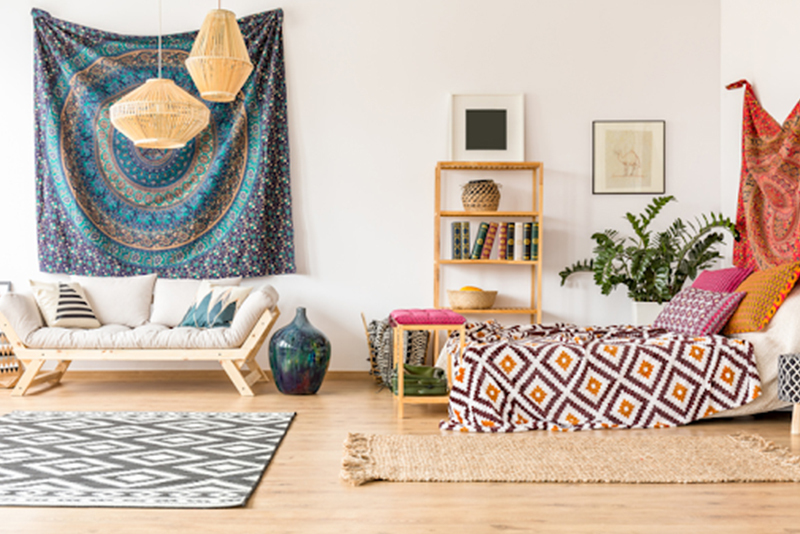 If your bedroom is in need of an added splash of color, going for a boho-inspired rug with all the vibrant colors is highly recommended. This type of rug is an eye-catcher for sure plus it does feel good under your feet. Another fun and fresh option is a sky blue area rug which is perfect for a beach themed bedroom. This will look good along with white walls, some wood accents, and an ocean blue colored bed spread to capture that beachy feel. Patterns like Chevron can help dress up the hardwood floors in your bedroom. Choose a color that will complement the wood stain on your flooring. Another type of rug that you can consider for your bedroom is the Persian rug. This Mediterranean rug has all the intricate patterns needed to add visuals to your space, making it the focal point in your room. What other types of rugs can you get for your bedroom? Sheepskin has this soft layer that makes your feet sink into it. It’s a great feeling to wake up and feel this soft rug under your feet. Another option for an area rug, especially for small bedrooms, is a striped rug. If you are living in a small pad or a dorm, a striped rug can create the illusion that your space looks larger. You just have to consider the color and style based on the overall theme of your bedroom. For those who have modern bedrooms, dark bedroom area rugs can be used as accent pieces to your décor, especially when you are into black and white color palette. This will certainly give your space an upgrade as well especially when mixing and matching with a modern bed frame. If you don’t want to go for large bedroom rugs, runner rugs will still give justice to your space. 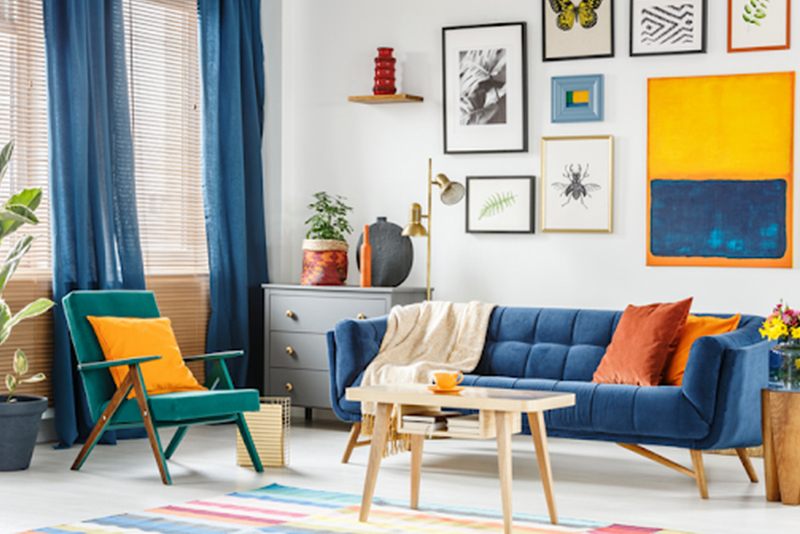 Not only will they add a splash of color to your room but, depending on the style and colors, it can wrap up the entire look of your bedroom. What are other options for area rugs? If you don’t want your bedroom chairs to damage your rustic river hardwood floor, employing a patterned rug under the chairs can prevent the legs from scratching the floor while adding a textured pattern on your floor. Swedish rugs are perfect for adding to your bedroom’s cozy atmosphere as the traditional designs of these area rugs speak of the country’s culture. It can be paired with a wooden bed frame or light-colored flooring to give your space that grounded feeling. Not all bedroom rugs have to look flat or come in a square shape. You can also use a wool tassel rug to add a homey atmosphere to your bedroom. A light-colored wool rug on hardwood flooring can give your space a natural look to it given the contrasting colors. The tassels can accentuate your area rug further. Just make sure that the tassels will not get caught on a chair or when you open or close a door. What else can you add to your bedroom? Well, a reversible rug will never go out of style since you can use either side to decorate your space. This does come in handy if you want to minimize your expenses because you can get two rugs in one! Since you will be integrating it into your bedroom, go for light colors instead to help soothe your senses. Decorating your child’s bedroom with bedroom area rugs is guaranteed to be fun because cute area rugs can help set a theme. Take for example the moon mission rug which is perfect for both genders. Add a bedside lamp that projects the stars on the ceiling and you’ll create a fun atmosphere for your little one to enjoy. Your toddler or young child is sure to be delighted when they see a heart-shaped rug at the side of their bed. Just make sure that it doesn’t slide when they jump out of bed. If you want to add a luxurious feel to your feet, bedroom rugs like the shaggy mink rug is a welcome addition, especially when you have wooden floors. They are soft, and they have this nice cushion feel to them. Another type of rug that you can add to your bedroom is a geometric rug. The patterns make them a great focal point. Multicolored rugs are perfect for accents in the bedroom especially when your color palette is pastel or light-colored. Go for multicolored rugs that will not clash with the rest of your bedroom’s décor. Faux bedroom rugs are also worth taking into consideration if you are looking for a beautiful rug that will not cost you a lot. Faux fur rugs give you that luxurious feel without the expensive price tag. Now that you have made your choice when it comes to bedroom area rugs, it’s time to ensure that you don’t trip over them. Whether you will be placing indoor outdoor rugs, area rugs under the dining table, or a runner, double-sided tape can help hold your rug in place. Double-sided tape helps keep the edges down to prevent tripping. It can also hold area rugs in place that are placed in higher traffic areas. If you are willing to attach the hook and loop roll on your floor, then this is one option to keep your area rugs from moving too much. It does get the job done and it’s easier to remove your rug when it is time for cleaning. What else can you do to keep your bedroom rugs from moving around? Another solution is to use a rug pad to give your rugs a good grip on your floor. Look for a rug pad that grips well especially on smooth and slippery hardwood floors. These rugs can also provide some extra cushion. Another tip to keeping your area rugs from slipping, bunching up, or sliding is to apply some hot glue to the edges or even strips of silicone-based caulking. If you are going to use hot glue, allow the glue to be cured before flipping over. However, make sure you investigate what effect these substances can have on the floor. Decorating your bedroom with area rugs is a nice way to give it a refreshing look without spending thousands of dollars. The good news is that there is an endless variety of area rugs that you can choose for every living area of your home. Make sure that you choose the right size based on the room size. You’ll soon be on your way to creating a whole new look. There are a lot of benefits to adding area rugs or carpets to your home. One of the benefits of adding a carpet or rug to your home is that they can add style and elegance to your space. The colors and texture can create a whole new vibe. Your choice of carpet can add color to your home and more personality to your space regardless of whether it is in the living room, dining room, bathroom, or bedroom. Another benefit to adding carpets and rugs to your home is that they can help soften the sound of footsteps as you walk around. An area rug with an anti-skid backing can reduce your risk of slipping on bare floors. What about the connection between carpets and clean air? Adding an area rug can help in clearing your air because it traps particles, such as dust, pet dander, and pollen in their fibers. Vacuuming regularly can keep your home air more breathable and reduce your chances of allergies.